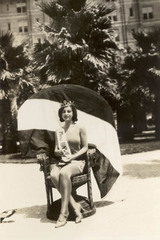 Miss Universe 1929 – Lisl Goldarbeiter. A Queen in Wien (Director: Péter Forgács, Austria/Netherlands/Hungary, 2006): The title isn’t the only thing unwieldy about this film. Based on the old photos and films of Maritz (Marci) Tanzer, the film attempts to trace Marci’s love for his cousin Lisl Goldarbeiter, “the most beautiful woman who ever lived,” and Austria’s first Miss Universe. The action takes place over the course of their lifetimes, encompassing war and peace, Naziism and Communism, Austria and Hungary. There is a wonderful story in here, but I constantly found the way the film was constructed maddening and annoying. Film clips appear out of sequence, are repeated, and are purposely cropped or panned in such a way as to draw attention to the director. In addition, the grating soundtrack kept pulling me out of the story rather than drawing me in. The decision to narrate the film in English was ill-advised, also, since some of the narration isn’t translated correctly. For example, I highly doubt that Marci Tanzer was “captivated as a prisoner of war” by the Russian army. Lisl was indeed a very beautiful woman, and Marci’s dedication to her is touching. There is value in Marci’s old films as a social history, and there is a good love story here. I just felt it wasn’t well-told. This entry was posted in Documentaries, Film Festivals, Hot Docs and tagged #hotdocs07, austria, history, hungary. Bookmark the permalink.